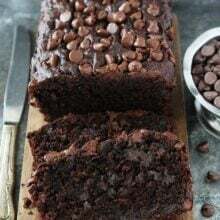 Chocolate Vegan Banana Bread – you will never know this chocolate banana bread is Gluten-Free and Vegan. It is SO rich, moist, and delicious! You guys, our original Chocolate Banana Bread is taking over the world! It is hands down the most popular recipe on our site right now. It’s going crazy on Pinterest, Facebook, and Instagram. Thank you to everyone who has shared your bread photos with us, left comments, and sent emails. You are obsessed with this banana bread and that makes me so so happy because it is my favorite too! 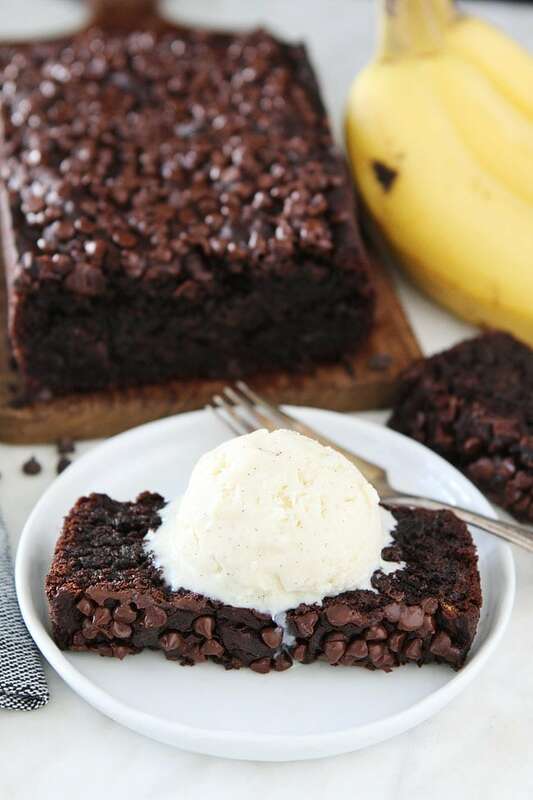 Well, we have gotten a ton of requests for a gluten-free and vegan chocolate banana bread so I put on my baking hat and came up with an EPIC Chocolate Vegan and Gluten Free Banana Bread recipe. You guys are going to love this one too! I used my original chocolate banana bread recipe as my inspiration but made some tweaks to make it gluten-free and vegan. I don’t do a ton of gluten-free baking, so I decided to use Bob’s Red Mill Gluten-Free 1-to-1 Baking Flour as the base. I didn’t want to mess with mixing my own flours and why take the time when Bob’s Red Mill makes it super easy. You can use this flour as a direct replacement for all-purpose flour and the results are amazing! I used Dutch process cocoa in this recipe too because it is my favorite. It gives the bread such a rich and divine chocolate flavor. You guys wanted chocolate vegan banana bread too so I mixed Bob’s Red Mill flaxseed meal with water instead of using an egg. Flaxseed meal is a great egg replacement and has Omega 3-fatty acids. Bonus! The mashed ripe bananas and coconut oil make the chocolate vegan banana bread super moist. I used coconut sugar to sweeten the bread and loved the results. Because it’s chocolate banana bread, I used vegan chocolate chips in the bread AND on top. 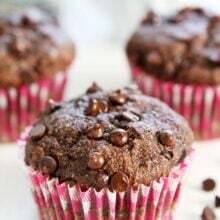 The chocolate chips on top make the bread are extra pretty and you can’t go wrong with a double dose of chocolate. Chocolate Gluten Free and Vegan Banana Bread Success! To be honest, I was a little nervous about how this bread would turn out. My fingers were crossed while it was in the oven. After it cooled and I sliced into it, all of my worries went away. I could tell this bread was going to be a winner. It looked very similar to my original chocolate banana bread. It didn’t rise as much, but that didn’t affect the flavor or texture. I was sold after one bite! It is super rich, moist, and tastes like my favorite chocolate banana bread. The bread tastes more like cake than bread…but that is not a bad thing. I topped a warm slice with vanilla Halo Top ice cream and was in dessert heaven. If you are vegan, you can use your favorite dairy-free frozen dessert. I nailed it! 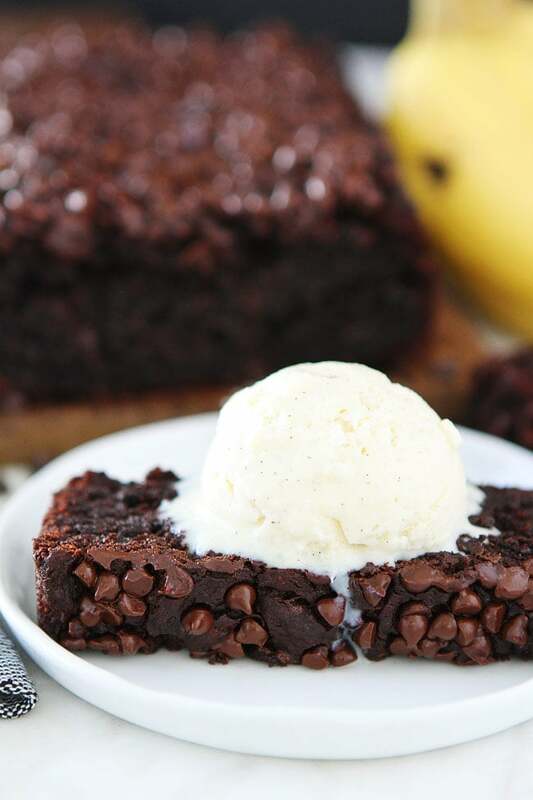 You guys are going to fall in love with this chocolate vegan banana bread too! The boys were anxiously waiting for me to finish taking pictures of the bread so they could have a taste. They had no clue it was gluten-free or vegan. They thought it was the best chocolate “cake” in the world! I also had a few of my gluten-free friends taste the bread for me and they gave it two big thumbs up. 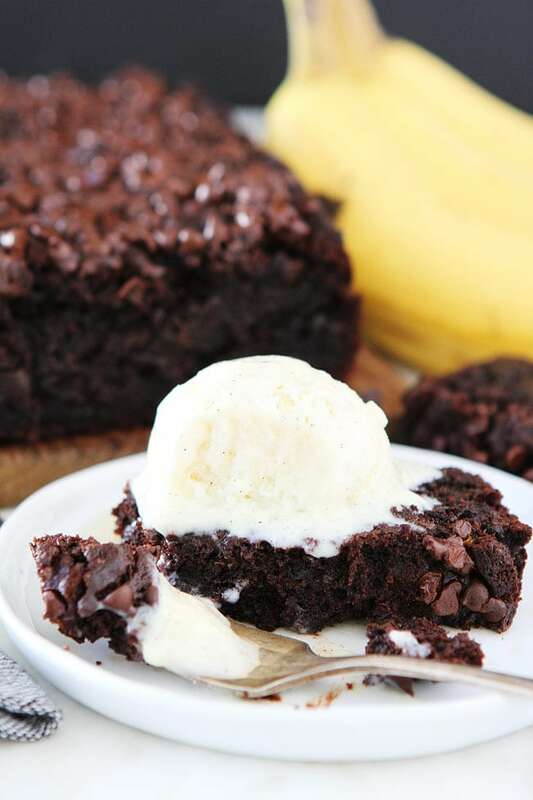 I am telling you, this Chocolate Gluten Free & Vegan Chocolate Banana Bread is a winner! Bake up a loaf today and see for yourself:) And if you don’t need a gluten-free or vegan bread, you can try my original Chocolate Banana Bread recipe. Both are incredible! In a large bowl, mash the ripe bananas with a fork. Add the melted coconut oil and stir until combined. Add in the coconut sugar, flaxseed mixture, and vanilla extract. Stir until smooth. Stir the dry ingredients into the wet ingredients, don’t overmix. Stir in 1/2 cup of the chocolate chips. Pour batter into prepared pan. Sprinkle the remaining 1/4 cup of chocolate chips over the top of the bread. Bake for 65 minutes, or until a toothpick inserted into the center of the bread comes out mostly clean, you might have some melted chocolate chips on the toothpick and that is fine. You just don’t want a lot of gooey batter on the toothpick. Remove the pan from the oven and set on a wire cooling rack. Let the bread cool in the pan for 15 minutes. Run a knife around the edges of the bread and carefully remove from the pan. Let the bread cool on the wire cooling rack. Cut into slices and serve. This is my Husband’s favourite dessert, he just loves banana bread – he even drinks the beer, haha. I must make this for him this week, thanks for sharing this. 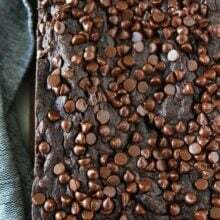 I so need this chocolate bread! It looks incredible and so moist! This looks epically amazing!!! 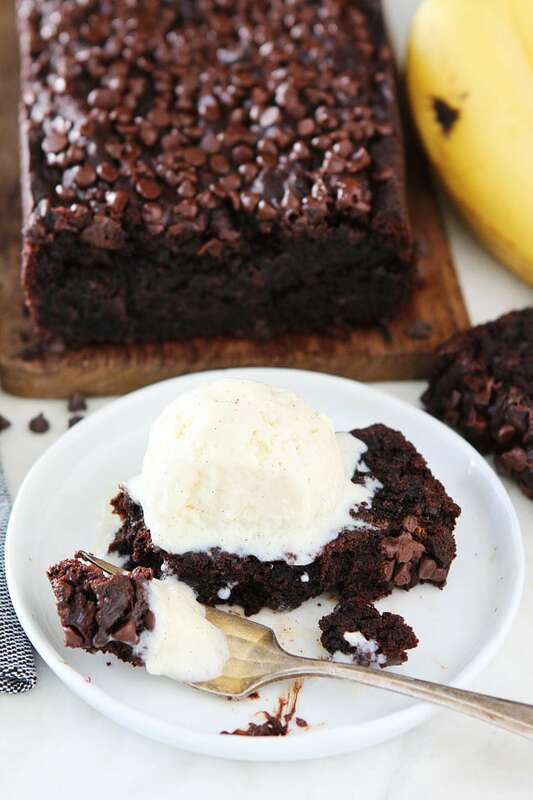 I love banana bread so much and the fact that you totally chocolate-ified and veganized it, amazing job! This looks absolutely heavenly! My mouth is watering. I love breads and chocolate. I can’t wait to try this recipe. Thank you! What a drop dead gorgeous banana bread! Oh my gosh, Maria, I cannot WAIT to try this!! Looks mouthwatering! Thanks so much Kristin! I hope you like it! WOO HOO!!!! this is absolutely perfect for my family Maria! this looks so good! i’m assuming that if i’m not looking for a gluten free recipe regular baking flour could be used? 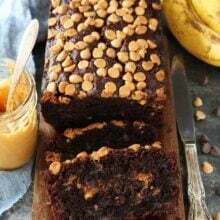 If you don’t need a gluten free or vegan bread, you can make this recipe: https://www.twopeasandtheirpod.com/chocolate-banana-bread/. It is the original recipe. hey girl- this looks awesome! 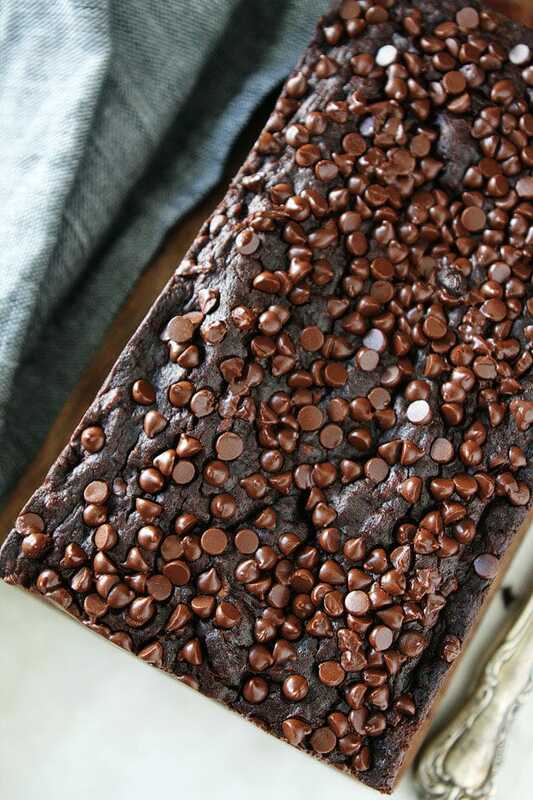 That fudgy cake and all those little chocolate chips look SOOO tempting! I’ve been wanting to make your recipe (it looks similar to this one) for a long time and for some reason, I haven’t. Maybe I’m worried I’d finish it all in one sitting? This looks incredible! I need this in my life! This is the ultimate banana bread! How delicious! Looks brilliant! Can I substitute almond flour for the Bob’s Red Mill flour? And if I don’t have flax on hand (and don’t mind the vegan bit) can I sub 1-2 eggs? Thanks for this recipe! I haven’t tried almond flour, let me know if you try it. If you don’t need the recipe to be vegan, you can use one egg instead of the flax. Enjoy! I tried the almond flour + egg substitutions and it turned out great! It didn’t bake up sky-high but that’s fine by me. The flavor is delicious and it looks pretty. And a scoop of vanilla ice cream on top seals the deal! Thank you again! Oh good! I will have to try it with almond flour next time. I am so glad you liked it! Thanks for letting us know! Did you use the same amount of almond flour as the kind of flour she listed on the recipe? Just 1 egg? Thanks! Thanks for sharing your secret, it’s must be delicious! I had to freeze my bananas before they got to the mushy stage, can I still use them in this? If so best to whizz them in the processor or defrost and mash? Can`t believe this is gluten free. I made it 2 weeks ago and the results were amazing. Can you substitute honey or maple syrup or even sugar for the coconut sugar? How much would you use? I don’t have coconut sugar! This looks amazing! I haven’t tried honey or maple syrup. I know brown sugar works! Has anyone substituted apple sauce for the coconut oil? This bread is delicious!! Since I have to eat gluten free and also can’t have eggs this is a perfect recipe for me! I keep Better Batter gf flour on my shelf so I used that for this recipe instead of Bob’s Red Mill. I also did a chia egg instead of flax egg because that’s what I typically use for my egg substitute. The bread turned out perfect! I will make this again and again! Thanks for the awesome recipe! If I want vegan but don’t need gluten free can I follow this recipe and just sub regular flour? Chocolate and Banana Cake. Mmmm the union of my two favorites..and a perfect weekend indulgence. I cannot wait to try this yummy dish. Thanks for sharing this recipe. Being gluten free has been hard due to being able to have quick breads like this. However, this isn’t by far the best banana bread I’ve ever eaten!!!!!! Thank you for bringing some normal back to my gluten free life !!!!!!!! So happy you liked the bread. It is so good! Yes, you can use regular unsweetened cocoa too! Enjoy! Is it ok without the coconut? I found that my dough is very thick, is this common for this bread? Not sure if I did something wrong! It’s in the oven now, waiting to see final results! Did you use the same amount of almond meal as she says to use of the other flour? 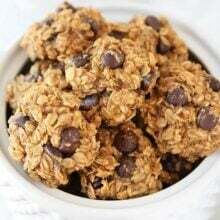 Did you increase egg or egg substitute with the almond flour? Made this the other night – absolutely delicious. Shared at work. Everyone loved it! I am vegan not gluten sensitive and am assuming regular flour substitutes at the same measurements? Delicious!!! I used whole wheat flour instead of gluten free. It was also done in 50 minutes. I will definitely be making again. This is the BEST recipe around! Not only is it great on its own, but it also subs for chocolate cake any day of the week. I recently made this as two nine inch round cakes (baked for 30 minutes). No one believed the layer cake I brought was gluten free and vegan. It was pretty incredible. Has anyone tried adding zucchini? I know it would add more moisture so not sure best way to go about it but would love to add some veg to it. 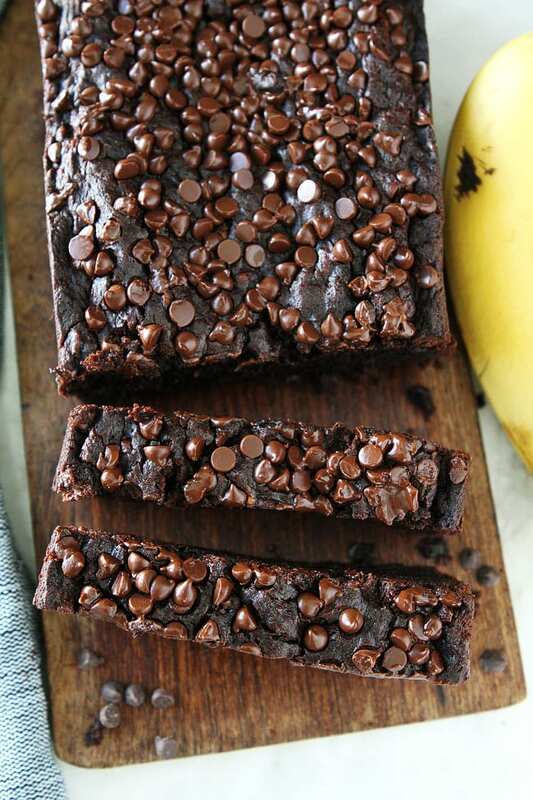 I love anything with chocolate, zucchini and bananas! You could try doing half banana and half zucchini if you want. Let me know if it works out! 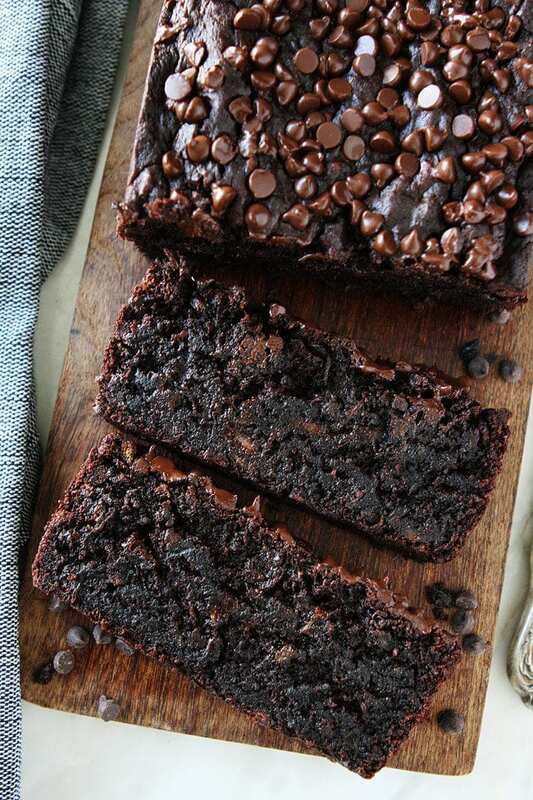 We have a chocolate zucchini bread recipe on our site that is delicious too! I made it without the chocolate chips on top, and it was still amazing and chocolate-y. Hi Maria! Would I use just one egg to replace flax meal? Thanks! 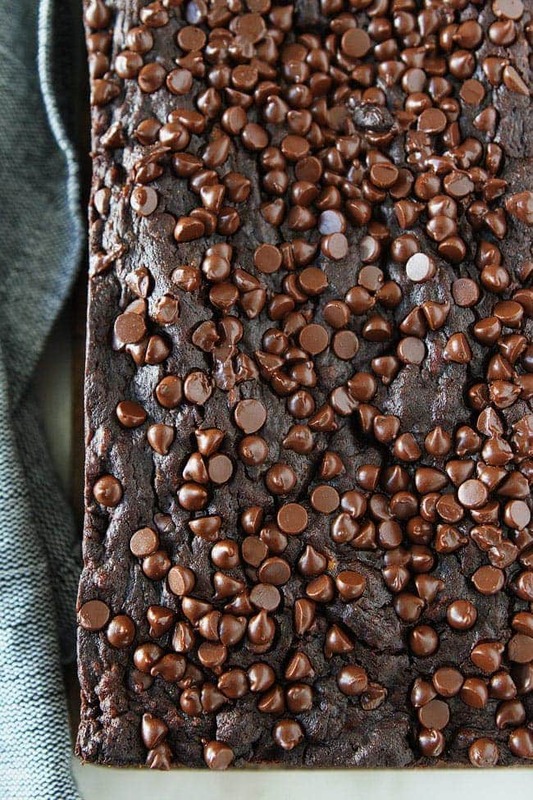 This looks like the most perfect chocolate banana bread ever. Excited to try it, thanks for the recipe! I just made this tonight following the recipe exactly. It is divine! I recently found out that I might try to trick my non-vegan, gluten-free family with this recipe to show them just how delicious food can still be without adding meat or gluten products. Mmmmm. I made this today!!!!! It is fantastic!!!!!!!!! So happy you liked the bread! Yay! Any recommendations if I want to use almond flour? This recipe sounds amazing! This looks so delicious! Like the chocolate cake from Matilda. Can I sub applesauce for the flax? PS – I’ve made the non-vegan version of this and it was awesome! I haven’t tried applesauce. Let me know if it works for you! I can’t believe this is GF, vegan, and banana bread. I get to call it healthy when its essentially chocolate cake- thank you. So delicious! Made these last night, followed the recipe and even the brand of the ingredients lol the batter was super thick so I added some almond coconut milk to be able to mix it in the end. Literally just enough until I could mix it without overmixing or make too much effort. These turned out SO great! I didn’t expect anything less, obviously 🙂 they look and taste amazing, and I warmed it up and had some for breakfast with a glass of milk… feels like having brownie for breakfast, only better! Already want to make it again!